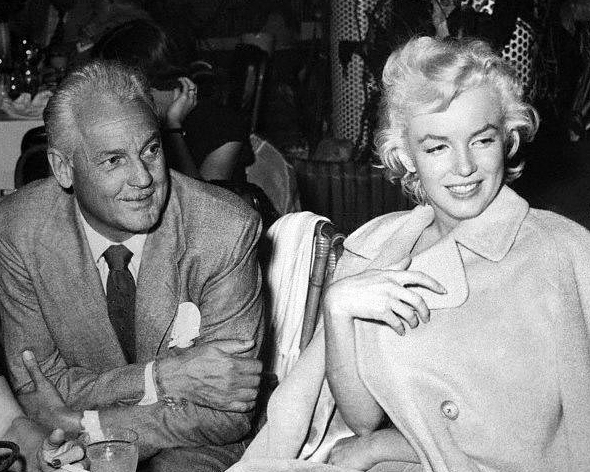 Charlie Farrell with Marilyn Monroe at the Racquet Club in Palm Springs. Or this one: For several years Jack Benny used to have an annual skit on his weekly radio program called “Murder at the Racquet Club.” In one such, Benny, as the sheriff of Riverside, drove up to the front gate of the Racquet Club and demanded admittance so he could investigate the homicide. “Are you a member?” intoned a voice over the club’s public-address system. “Then you can’t come in,” said the voice. “All right, throw the body over the wall,” Benny shouted back. Shortly after this profile of Farrell was published, the Racquet Club was sold and quickly became a pale shadow of its riotous past. His wife, Virginia, died in 1968 and Farrell, fed up with the whole scene, gave up the life of the bon vivant to stay home in his bathrobe and watch TV night and day, waiting for the end to come. Unfortunately, he had a bit of a wait; the years were unkind to Farrell who, they say, descended into senility and decrepitude. 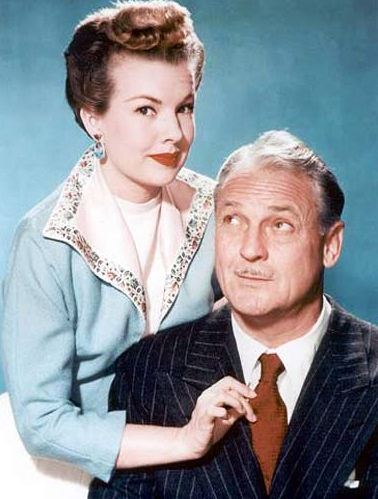 Charlie with his "My Little Margie" co-star Gale Storm, who he reportedly detested (the feeling was mutual). When he died, a few months short of his 90th birthday (a lot of bio’s say he died at 88 or 89 but Farrell, like a lot of Hollywood stars, fibbed a bit about his age over the years), even the local press didn’t take notice for several weeks. Charlie Farrell, the soul of conviviality, founder of the Racquet Club, former mayor, star of the silent screen and TV, ended his life a reclusive desert rat. He was buried, without services (and with almost no mourners) twenty years ago in Welwood Murray Cemetery in Palm Springs. For years it was almost impossible to visit Farrell or other well-known celebrities buried there, like Nellie Coffman and mid-century modern architect Albert Frey, as the cemetery was locked and gated. These days it’s open daily for visitors. Charlie, who always knew how to pick his real estate, has a prime location in row 10-3, plot G. Virginia, who he always referred to as his “beautiful, long-suffering wife,” resides next door in plot F.
I have to say–I think there’s a movie here. Great post. I want to go to the Racquet Club now. Thanks, Peter. Matt told me last summer that he was thinking of writing a book on the history of Palm Springs. It’s so rich…I hope he goes forward with it. That was amazing. I love old hollywood glam. I’ve been looking for info on the Racquet Club for a long time but there is really not much info on the net about it. I worked at the club for a few years in the 90′s. It was such a great place to work and I feel lucky to have been in the Bamboo lounge were all the famous stars used to hang out. It is such a shame the city of Palm Springs allowed the property to be sold and now if sits vacant and decaying because the owners went bankrupt trying to develop it as condos.